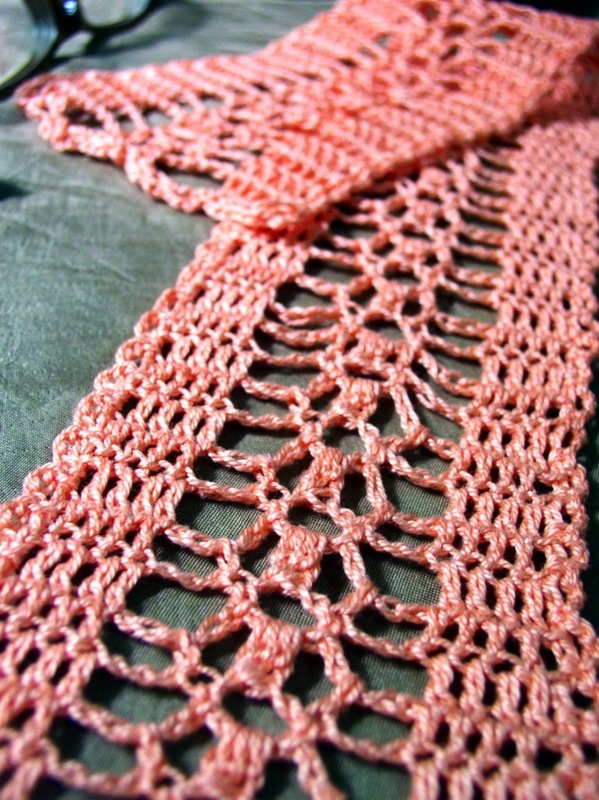 I made this pattern because I wanted a lacy, not too thick, scarf that did not stretch narrow. Make this scarf long or short as you desire. Add fringes at the ends if you wish. Experiment with colour. Approximately 17.5 inches. 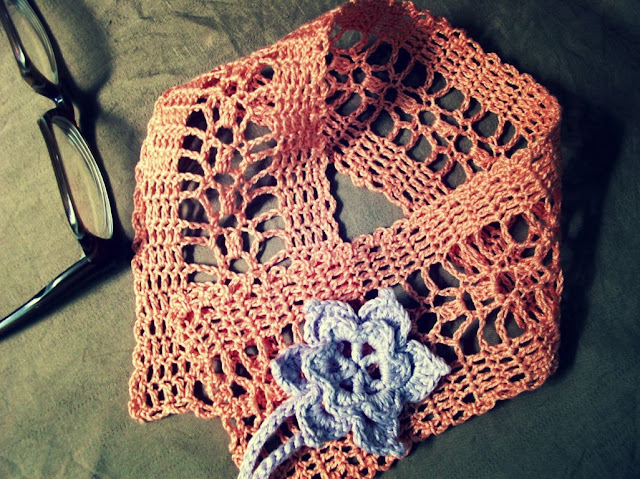 Longer scarf can be made by adding more rows. 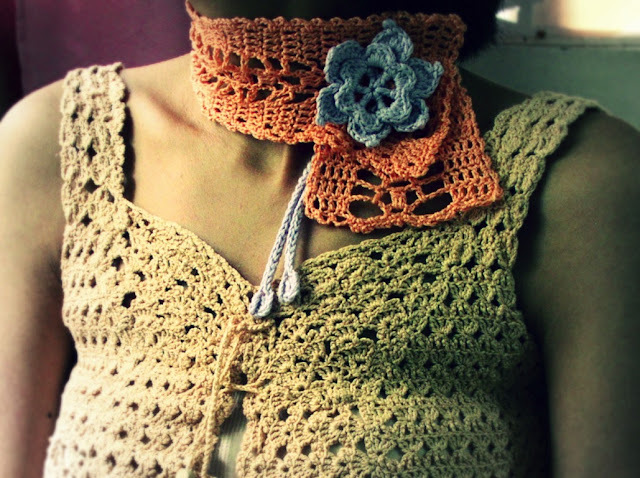 The scarf and flower are worked separately. The flower is attached to the scarf by tying the flower's ties through the lacy holes in the scarf, then the scarf is kept in place by passing the ties through the holes of the other end of the scarf. You can also use the flower as a corsage by sewing a pin at the back. Row 1: Ch 3 (makes 1 dc), dc in 5th ch from hook, dc in each of next 3 ch, ch 5, sk 4 ch, sc in next ch, ch 3, sk 1 ch, sc in next ch, ch 5, sk 4 ch, dc in next 5 ch, ch 3, turn. Row 2: Sk first dc, dc in next 4 dc, ch 3, dc in ch-5 sp, ch 1, 3dctog in ch-3 sp, ch 1, dc in ch-5 sp, ch 3, dc in next 5 dc, ch 3, turn. Row 3: Sk first dc, dc in next 4 dc, ch 5, sc in next dc, ch 3, sc in next dc, ch 5, dc in next 5 dc, ch 3, turn. Row 4-48: Rep rows 2-3. Picot edges: (These are just 3-ch loops spaced evenly all around the scarf) Ch 3, sc around post of first dc, ch 3, sc around same dc post, ch 3, sc around next dc post until end, making two 3-ch picots at every corner to turn. Fasten off. Rnd 1: With two strands of lilac color thread held together, ch 6 (count as 1 dc, ch 3), dc in first ch, [ch 3, dc in same ch] 4 times, ch 3, sl st in 3rd ch of ch 6 to join. Rnd 2: Ch 1, *[sc, hdc, 3 dc, hdc, sc] in ch-3 sp, rep from * for all ch-3 sps. Ch 1, sc in back post of first dc of previous row. Rnd 3: [Ch 7, sc in back post of next dc] 6 times. Rnd 4: Ch 1, [sc, hdc, 4 dc, ch 3, sl st in dc just made, 3 dc, hdc, sc] 6 times, sl st in back post of first dc of row 1. Rnd 5: (First tie) Turn to wrong side, ch 43, 2 dc in 4th ch from hook, ch 3, sl st in same ch, sl st in each ch to end, sl st in same dc post. Rnd 6: (Second tie) Ch 5, sl st in dc post opposite current post, ch 43, 2 dc in 4th ch from hook, ch 3, sl st in same ch, sl st in each ch to end, sl st in same dc post, fasten off.